Discussion in 'Calibration, Help, and Troubleshooting' started by Spoon Unit, Mar 28, 2016. This is not strictly about the BB, but with so many of us using S3D, I thought I'd see if anyone has any ideas. I've got a small test model I'm using to try to get to the overall best settings for printing with the 1.2mm volcano nozzle. One thing that is obvious in each print is that the top three layers have a different look to the rest. Seen inside S3D I can clearly see the different speed for the solid infill layers being indicated. I can't see why it's not obeying the same outline speed as other layers though. Any ideas? View by "feature type" and one sees tops are classified as "solid layers". My part TOP (to the right of image below) shows Solid Layer surrounded by Inner Perimeter and then Outer Perimeter (Volcano 0.8mm, 1.25mm extrusion width). @Spoon Unit The effect you see is based on the size of your object. That the lower outlines seem to be at the same speed like the infill on top and the outlines on top is by chance. To solve go to "Cooling" tab and deactivate "Adjust printing speed for layers below ...". To explain: this setting lowers the speed of layers which would print faster than the set time interval up to the set speed minimum percentage of the default speed so that the time spent on the layer is at least the set time interval. Your lower layers have infill, no solid infill, so the time at normal speed would be too short so the speed is reduced. You top layer has solid infill, so the time at normal speed is higher, therefore no reduction happens. I encountered this problem myself when doing test prints. Test prints are usually small objects with a certain geometry to test certain extrusion and movement parameters. To be able to compare them with a normal print you should setup the process as if this would be part of some bigger model. Maybe you will get some other effects when you disable this because of the shorter time the print head stays on one layer. You should be aware of what could happen when you disable this. This setting is meant for models getting thinner at their top to prevent melting of a top area because the process moves too fast to the next layer leaving the previous one not enough time to cool. @Alex9779 thanks for the input. You are dead right. I posted the question onto the S3D forum this morning and got a response within an hour, so then I latched onto the speed issue. The top layers take longer so can run at full speed, the lower layers complete quickly with the fat nozzle and infill choice, thus leading to a slower pace. You can control this too. I didn't re-run that test after, but I just wanted to know what the cause was. What is the problem with the final layer that you have to use a second process? I stay away from using multiple process les as far as I can for one model. I would like to but I hate the setting for solid filled layers at the start and end. Using multiple processes you get solid layers within the model. You can deactivate them at certain models because when you then have overhangs you loose the solid infill there. And those layers tend to shrink a bit more so you get a no so nice outer finish. So far I think S3D has some nice options and what I like most is the slice speed and the visualization. But it is far away from being the slicer. I want far more option to control the movement. I got some ideas how to fight certain problems but the settings won't let me do that. The problem is that, with a really fat nozzle, you end up with gaps. You get this with small nozzles too but they're less noticeable. What are you doing in the second process for the top layer? Extrusion multiplier? 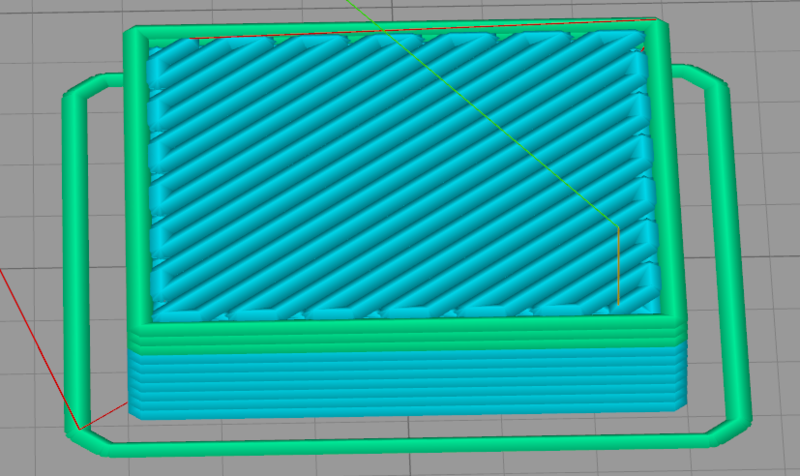 Extrusion width? In the second process, all I changed was to have two outlines, thus filling in the gaps. @Spoon Unit here's a thought: did you try the S3d / Infill / External Infill / Concentric setting? What does that do for gaps? If you have more shells, you can hide the gaps within the shells by increasing the infill/outline overlap. I did two Benchy prints using 3 shells, and a 15% overlap and 33% overlap. At 33% you're printing over the top of the inner shell completely and, even if this is possibly overdoing it, does result in gap removal.